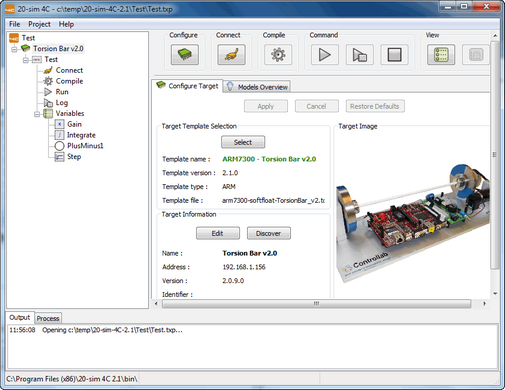 20-sim 4C is a prototyping environment that allows you to export C-code to hardware like real-time PC systems and embedded real-time Linux processor boards. The name 4C stands for Configure, Connect, Compile and Command and these are the tasks that you have to perform to get code running on a target. The main window of 20-sim 4C shows these tasks at the top of the window. The collection of C-code files that will be exported to the target is called a model, like the model in 20-sim. The model is shown in a tree at the left of the main window as part of the selected target. The tree also shows configuration properties for the model: I/O connections, run settings, data logging settings, available variables for logging and monitoring and configurable model parameters. In the configuration step, you can select the target platform for your generated code. After the target selection, 20-sim 4C will automatically search on the network for your target and connect to it to retrieve its current status. Most targets have connections to onboard and external devices (e.g. sensors, actuators or other I/O devices). In the connect step, you have to connect the inputs and outputs of your model to the proper target devices. To get the C-code running on a target, a compiler is used to create executable code. With the command buttons you can run the executable code on a target, stop it, monitor and log variables. Use the view buttons to show variables and plots.